Drone product is more popular and known by people these days. Many types and brands of drones or quadcopters so that people are looking for the best product based on their need and hobby. Syma is one of most popular brand which is known as a good product made in china with many of them are affordable. In this article, we will compare between two of Syma products. Syma X5C and Syma X5HC. Syma X5C is the good choice which offers the inexpensive price of the similar products in the range. This product is easy to learn so that the beginner will be easy to use it omce they try flying it. Syma X5C is light, powerful and responsive, you will get nice experience flying this drone and this drone is also built from strong material so it will help this product give the best performance from the first time we fly it. This product offers 2MP HD Camera so it will be best for you to take the picture or video using it. On windy days, the pictures or videos might come out a little shaky. However, on a calm day, it is possible to get smooth photo video results. The batterylife of this product only lasts for 7-10 minutes with the 90 minutes charging time to get the battery full before you flying it for the next flight. Take a look: Syma X5C Vs Syma X11C. Same like Syma X5C, Syma X5HC is also equipped with 2 MP Camera. Xyma X5HC fairly affordable toy grade drone, easy to control makes a good learning and practicing quadcopter. Syma X5HC also features altitude hold, headless mode and flip mode. This mid-size quadcopter is worth for the price and working very well from the first time you fly it. Design of this product is simple and interesting. Video is recorded at a resolution 720p at 30FPS and uses the Motion JPEG video codec (MJPG) video codec. This product battery life only lasts very low only for 5-7 minutes flight time powered by 600mAh battery with charging time approximately 90-130 minutes to get it fully charged. - Battery Included, enjoy a longer flight time! The conclusion is both of product can you get with affordable budget, the quality of product is good and design is very great but Syma X5HC battery life only lasts for 5-7 minutes very short than Syma X5C. The camera quality is the same. 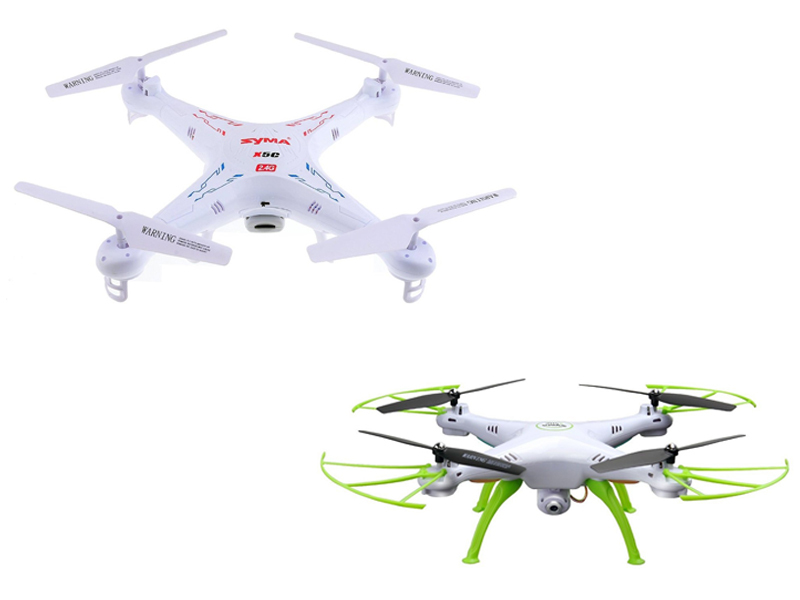 Both of products is mid-size quadcopters. So, if you want to choose a simple product with affordable price with camera featured and good performance Syma X5C and X5HC will be the good choice. If you feel the batterylife is too short, make sure to take the second or back up battery to keep using.